NEAR ALL, SPACIOUS 2 BR CONDO # 301 FULLY FURNISHED, WIFI, SEA & MOUNTAIN VIEWS! FULLY FURNISHED, SPACIOUS 1100 SQ. FT 2BR HAS WIFI & ALL YOU NEED IN A HOME! GREAT LOCATION: Walk to the Marina Restaurant & Resort and finer beaches from our CondoApartment! You will feel right at home with our spacious, spanish tiled, fully furnished 1100 sq. ft. 2 BR w/large bathroom, living room, dining room kitchen, balcony and deck to bask in the sun, watch the sunrise, or just enjoy the panorama of Sea and Mountain views right from "your home away from home". Close to All! Convenient! Safe with onsite assistance and maid service!This CondoApartment is in the preferred tranquil location of Playa San Felipe that has all the modern city amenities, convenience and city services including daily 24 hour police patrol and paved roads. We offer free high speed internet, cable TV, 3 cold air-conditioners one in each room, hot water, maid services. It is away from the noise, hustle and bustle of town, yet it is only 2.5 miles south of town. Near all-beaches, marina, restaurant, shopping, dining, bars, clubs, casino, hospital, 7/11, bus transportation All these at such unbeatable low rates! GORGEOUS SEA & MOUNTAIN VIEWS: Relax in tranquil surroundings, Breathe in fresh mountain air and sea breeze right at this CondoApartment. TRULY “YOUR HOME AWAY FROM HOME”: Comfortable, Spacious, Fully furnished, Fully serviced kitchen. Washer, dryer. Linens & bath towels, shampoo & soap are provided. Onsite Assistance. Maid Service upon request i.e., housecleaning or Mexican meals cooked. We can make arrangement for Fishing trip, Massage. Tour Guide. San Felipe Travel & Info Guide is provided for your reference after you book. It gives directions, maps to our CondoApartment and San Felipe, things to do, and places to go. First timers to San Felipe will find this guide invaluable. This is my "home away from home" where I can live comfortably whether short term and long term. Because I value my freedom and security, it is important that I don’t feel restricted with unnecessary strict rules and regulations of a gated community, yet have the freedom to explore my beautiful environment and surroundings without threat of security and endangerment. We are proud to say that our CondoApartment offers this. Our area is patrolled round the clock, and we have an onsite assistant who lives with her family on the property. In addition, we furnished and decorated the CondoApartment tastefully with comfortable furnitures and decors that blend well with the rustic environment. This condo is light, airy and roomy, very comfortable and relaxing. This is a town and a neighborhood where family and friends can always relax and feel free to drive or walk around. Our list of satisfied and returning customers is a testimony of their overall satisfaction and comfort level with our CondoApartment. COMFORTABLE, CONVENIENT, AFFORDABLE, SECURE, CLEAN, RELAXING & FEELS LIKE HOME DESCRIBES THIS CONDO. THIS AREA SOUTH OF TOWN IS KNOWN FOR ITS FINER BETTER BEACHES, GORGEOUS VIEWS, TRANQUIL SURROUNDINGS, YET JUST 2.5 MILES TO TOWN. Walk up to the Deck from your bedroom and enjoy the breathtaking 10,000 ft. mountains. From your living room and balcony. Enjoy the spectacular sunrise and sunset or just relax looking at the spectacular view of the sea from your living and dining rooms. Walk to the San Felipe Marina and the Beach. You can hire the services of the housekeeper to perform additional cleaning or to cook Mexican meal for you. Convenient and Comfortable!. Truly your home away from home. Spacious tiled bathrooms. Shower area can hold up to 3 persons. Less than 3 miles from the apartment. We are less than a mile from the Marina where you can haggle the fresh catch of the day. San Felipe Marina Resort hotel is just one mile south of the apartment. One can walk to its fine beaches or dine in their waterfront restaurant. We are less than 3 miles from downtown. Gorgeous view of the Sea of Cortez from the Upstairs unit. All Bedrooms have panoramic mountain views of the San Pedro Martir mountains. Gorgeous view of the Sea of Cortez from the Upstairs unit. The beach is less than a mile within walking distance. Parking conveniently located a few steps from the Apartment..
Wireless internet in the bldg. Towels available for those staying 3 days or less. Long term guests must bring own towels. See our Ground Floor Listing which is handicap friendly. Additional chairs and an extra foldable table can be added upon request. There is a balcony in front of the living room which faces the Sea and a deck behind the bldg and the bedrooms which faces the panoramic mountain views. At San Felipe Marina Resort, a mile south. At La Ventana Del Mar, a Brad Benz 18 championship golf course about 7 miles north of downtown San Felipe. Ask about our Ground Floor Unit which is wheelchair accessible. A block away, One home offers swimming lessons and use of their pool based upon appointment at a reasonable fee. Condo was clean. Didn't stay because of no heat, waste of money if the weather is cool. Lot of motels that are cheaper and nicer. We are glad you found the place clean. Most homes in San Felipe don't have heater because it has been known to have 330 sunshine days a year, the reason San Felipe is a favorite for snowbirds during winter. But we didn't promise heating. And San Felipe was cooler than usual in the ave 60's this winter just like the Southern California weather but with much less rain. I would certainly love to hear of cheaper motel or hotel.rates that provide a fully furnished 2 br with living room and fully furnished kitchen with sea and mountain views I can stay in when our condos are fully booked. Would appreciate your referral of these type of accommodations in San Felipe. Thank you. The place was spacious and really clean. Perfect for a long weekend stay. Nearly everything provided for you. The host was great, gave us detailed information from tasty places to eat, things to do, and awesome directions. Trust me all those things come in handy. You really are close to everything. I enjoy off-roading, I was really pleased to be so near the San Felipe dunes and trails all around. Being able to see the ocean as walk out to the living room is always a great feeling. We will definitely be staying there again. Price, views and location were good. No heat was a big issue. The views were great, the location was good, the size of the apartment was perfect and the owner was very accommodating and quick to fix any issues. My big disappointment was that there was no heat (and it was very cold for the 2 months we were there) and no full size oven. I managed to make most things in the toaster/convection oven, but it was a little small for other things and there is no temperature control. The apartment has recently been re-tiled and the shower redone, and both are beautiful. However, the rest of the apartment could use some refreshing. Painting and new counters would make a big difference. The kitchen had a good range of dishes, etc if you're staying for a few days. Any longer and make sure you bring your favourite items. We received a friendly greeting from the resident manager. There were a few minor issues and maintenance problems but those were promptly taken care of for us. We are "seniors" so local attractions and activities are more than walking distance for us, but the town and people are warm with lots to do both day and night. We recommend these apartments for people who want the convenience of a kitchen and to be away from the town's many noisy festivals. Stayed for one night it was good for the price, beach wasn't far at all. Owner was super nice and helpful. Good peaceful location. Short distance to beach and board walk. Keys to the apartment are picked up from Vicki, our onsite asst. manager and housekeeper who lives in one of the 4 apartment units with her family. Once you have booked, we will provide you with a vacation/ travel guide to San Felipe which provides directions to the apartment, places to go, things to do and things to do. 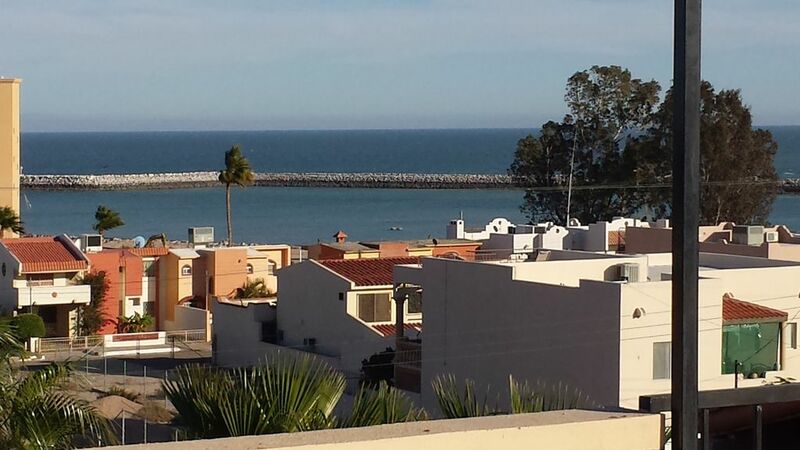 You will find our apartment location so ideal, so close to downtown San Felipe, yet away from the hustle and bustle to enjoy the tranquil setting amidst the majestic mountain and the deep turquoise colored sea and fresh country air. Some activities in San Felipe include ATV riding in the sand dunes of San Felipe, less than a mile away. Sightseeing can include a ride south of the apartment to Puertocitos where you can experience a natural hot mineral bath, or visiting the giant cactus that is as high as 30 ft. or taking a scenic drive to Gonzag Bay. The beaches are finer south of town where we are located.The Marina is within walking distance where you can haggle and purchase the fresh catch of the day. 3 miles north of us is San Felipe downtown with lots of restaurants, shopping and casino. Rates include wifi, cable, electricity. Monthly renters includes all utilities but electric bill is limited to $50/month. Above this, guest pay. A separate electric meter is assigned to each unit. Please contact me for any special arrangements. For those who wish to stay long term, I will accept a first month advance and one month deposit and monthly payment after that.